The largest preserved stretch of the former border between East Germany (GDR) and West Germany (FRG); here it even has a form very much reminiscent of the Berlin Wall, better than anything in Berlin itself, and as such is one of the most significant monuments commemorating the Iron Curtain anywhere in the world! More background info: cf. other border museums, esp. Mödlareuth and Schifflersgrund, as well as Marienborn and Berlin Wall. What there is to see: of all the remains or reconstructed sections of the former GDR border in Germany, the border "memorial" at Hötensleben is the most impressive, in as much as it is the most complete actual stretch of that border anywhere. The full array of the typical GDR border fortifications has been preserved almost in its entirety here – and a good stretch of it too, some 400 yards (350m) in total length and over 15 acres in area. Since here the border went directly past a village, it was built not just with fences – as in the open countryside – but in the form of the Berlin Wall. And it's in fact the complete system: with front border wall facing the actual border with the West, vehicle blocks, sand strips, patrol track, wide open area (for free shooting space with no cover anywhere), lamp posts, signalling fence and inner wall, i.e. facing the East. Two watchtowers, one a border guard command post overlooking the whole complex, the other a shortened, smaller observation tower, complement the whole ensemble. At the far end, visible from virtually everywhere, you can see the ominous shape of the main watchtower of the complex, the former command post, on the top of the hillside just north of Hötensleben. It is also the other dominant feature when seen from the other side of the outer wall, which is obviously the core part of the memorial. These days you can, as it were, just walk through the wall, namely along the road leading west. This is taken across the former border river (or rivulet rather) by a new road bridge, where a brown sign marks the former border – like in so many places where otherwise no trace of the border remains. In the grassy open area between the border river and the outer wall a single GDR border marker pole can be spotted, painted in the characteristic black-red-and-yellow. Between the two border security strips, by today's road, is a small open shelter where there's an interactive information terminal, whose computer screen looked a bit inactive, though, when I was there (May 2012). Here you can also pick up some leaflets about the site and associated places. Behind is a series of information panels providing general historical background and so forth. Only one of them, the basic welcome panel, also has an English version. The remaining information panels dotted all over the complex are in German only. But even without much knowledge of German you can get something out of these panels thanks to various diagrams and photos from the old days that illustrate the relevant aspects further. Walking along the patrol track "behind". i.e. east of the outer wall, you'll spot a couple of wreathes placed directly at the wall – these are in memory of those who lost their lives at the border, both here and elsewhere. Further on, the border strip is virtually still in the shape it was when "in use" until 1989. Apart from the wall, the string of steel vehicle barricades is probably what stands out most. Not even a large lorry could get over these. The neatly raked sand strip between the row of barricades and the patrol track is evidently still well tended and few footprints could be seen in it, so it looks like it's still serving its purpose astonishingly well. The border strip with the outer wall zig-zags for about 400 yards northwards, after which the wall is replaced by the more common metal fence. Where wall and fence meet is one of the gates through which border soldiers could enter the strip between the outer wall facing west and the border river ... e.g. for maintenance work – only especially trusted soldiers were given such tasks, of course, as they would have had it easier than any to just hop across into the West. The border fence continues for about as far as where it is level with the watchtower at the top of the hillside. After that it peters out and the former patrol track is all that remains of the border. If you walk east beyond the watchtower, whose inside is not normally accessible (only on special guided tours – see below), you can catch a glimpse of the remains of a former dog-run installation that continued around the north side of the village beyond the second border strip to keep villagers in check. Back by the road you could then continue your visit to include the bits and pieces to be found south of the road. Most visible here is another smaller watchtower that has been shortened to a mere 13 feet (4m) in height. Apparently this "truncation" was already done in GDR times because the tower wasn't stable enough. Near it stands another short stretch of wall – while most of the rest was taken down. Trees specially planted along the former course of the wall now mark its former location. Hiking further south along the old border patrol track will take you to a final, ca. 20m piece of wall and just before you reach this a path branches off to the right, i.e. westwards. This leads to the remains of a former railway bridge – which like most transport links was severed with the division of Germany. Today it serves as a pedestrian crossing of the ex-border river. Overall, however, it is of course the much more complete section north of the road that is the main attraction about Hötensleben as it presents the most authentic remaining piece of this part of the Iron Curtain. If you get the angle of view right, i.e. when you can't see the ends of the preserved memorial stretch, you can really get the most genuine impression of what this former long border between the two Germanies used to look like – and you can check it out from either side … which would never have been possible back then when the border was real! In that way, as a sight to behold, the "memorial" at Hötensleben even beats all the remains of the Berlin Wall put together (and also Mödlareuth). Only here can you really get a feel for the deadly sophistication and downright depressing efficiency of the GDR border design. For me looking at the Hötensleben memorial almost brings back a bit of that chilling feeling of having seen the genuine border in Berlin back in the 1970s and 80s – an eerieness that is near impossible to describe to those who haven't experienced it themselves ...either because they've never been to it or because they're too young to have had the chance. To all those I say: do go to Hötensleben, find a good viewing spot, add a touch of imagination, and feel that chill crawl up your spine. OK, it's still not the real thing, and without the GDR border guards and with the knowledge that all the installations and weaponry are not live, you won't get the same element of fear – but these days at least it's the closest you can get to what the GDR border felt like. Normally, the site is just there, to be experienced as it is, anytime you like. Occasionally, however, the site is used as a venue for cultural event in particular for smaller-scale rock festivals in the summer … Furthermore, when I was there, in May 2012, there was an art installation covering parts of the open area between the two border strips. While this was artistically intriguing, thematically linked to the monument and certainly executed with the best of intentions, I still found that it detracted a bit from the overall impression of authenticity of the border. In my view, it could have been better placed on the southern side of the complex, by the car park, say, where it wouldn't have had such a detrimental side effect. In any case, whoever has an interest in the Iron Curtain and especially the form it had as the border between the former two Germanys, should most definitely go and see this site at Hötensleben! Absolutely essential. Location: on the western border of Saxony-Anhalt's Börde region, near Schöningen in Lower Saxony, Germany, some 8 miles (12 km) south of Helmstedt (see Marienborn), which is right next to the A2 motorway (leading from Hanover via Magdeburg to Berlin). Access and costs: a bit off the beaten track, but easily accessible; free. Details: the border memorial at Hötensleben is freely accessible at all times. Daytime, obviously enough, makes most sense, and especially the early morning or late afternoon/early evening when the sun is low (which enhances photography) – in the morning it shines onto the eastern side, on the western side in the evening (take your pick, or go twice, for both, like I did in May 2012 – cf. photo gallery below). To get to Hötensleben you really need your own means of transport. Public transport is limited to a few buses with very infrequent connections – e.g. from Schöningen. Schöningen is itself only accessible by bus, mainly from Helmstedt (see Marienborn). It no longer has a working train line/station … instead the abandoned building and overgrown railway yard add a little dose of ghost-town atmosphere to the place, which may actually be a bonus to the dark tourist! Driving there is much easier. From the west the main overland route B82 connects Schöningen to the nearest hub Braunschweig, while the B244 leads north and south. Hötensleben itself lies on the small L652/105 routes about halfway between Schöningen to the west and Barneberg to the east. From the latter the 245a also provides access to the main east-west motorway between Hanover and Berlin to the north, as well as to the Marienborn memorial (see 'combinations' below). There is plenty of free parking at the border memorial, even toilets and some of the time visitors are even catered for, including from a former military field kitchen wagon. Guided tours – presumably also in English – can be arranged at the Marienborn memorial site (to which Hötensleben now also belongs), for a fee, but only for groups of 10 persons or more. You'd need to reserve well ahead of time. I would guess, though, that these are primarily intended for visiting study/school groups, less so for tourists, in any case. Time required: depends on whether you can read German to study all the information panels and also on how long you are willing to spend just letting your imagination flow at this site. I would say a minimum of half an hour for a really quick visit and up to two or three hours for a sufficiently exhaustive one, taking everything in at leisure. Combinations with other dark destinations: the Hötensleben border memorial has since 2004 been administratively part of the Marienborn memorial, and guided tours of both sites can be organized from there. The Marienborn site is only some 8 miles (12 km) away. It also thematically complements Hötensleben superbly in that it provides illuminating illustrations of the inner workings of the border security system of the GDR other than the concrete border fortifications (e.g. vehicle search equipment, interrogation rooms, as well as just the whole cold and eerie remains of this compound of "intimidation architecture" once associated with the border regime). The two sites can also be visited on combined tours, allegedly these can also be arranged in English – see under Marienborn site for contact details. 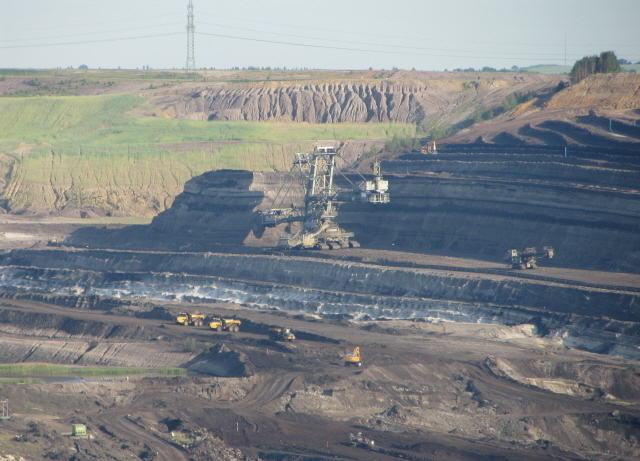 Just west of Hötensleben, north of the road towards Schöningen, lies a smaller lignite strip mining pit (see Lausitz strip mining areas), which has its own somewhat dark appeal – a big, black scar cut deep into the land, with huge digging equipment operating at its bottom. Apparently the pit will soon be exhausted and then undergo "re-naturalization", like many other pits in the area already have. When I was there, though, in May 2012, it was clearly still working. You are obviously not allowed to just wander down the pit – that would constitute trespassing – though I didn't see any insurmountable barriers either. Just by the road between Hötensleben and Schöningen, however, there's a viewing area set aside especially for curious visitors. Also on display is a small collection of open-air exhibits of old digging equipment and mine trains. An information panel (German only) provides some insights into the history and geology of the pit. Towering above Schöningen – and visible from the hillside part of the Hötensleben border strip – the German intelligence service (BND) operates a "secret" listening station, apparently an experimental military satellite dish compound of sorts. It's intriguing to see from a distance, but obviously remains out of bounds to tourists. For sites further afield see under Germany in general. Combinations with non-dark destinations: in general see under Germany – the immediate vicinity, especially Hötensleben village itself hasn't got much to offer passing tourists, but nearby Schöningen on the Lower Saxony side of the former border merits a stop for its castle and some other quaint old architecture. 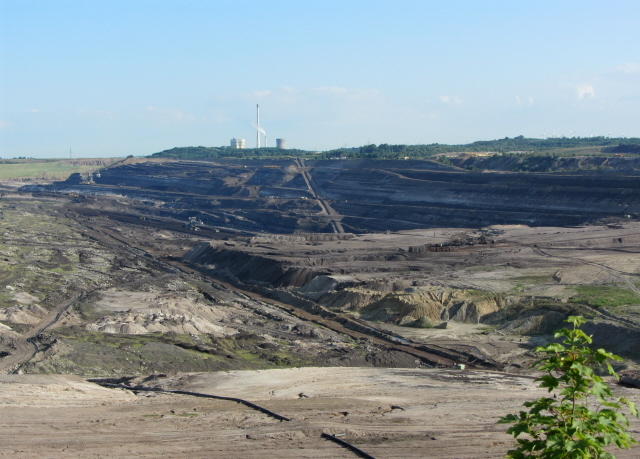 Schöningen is also recognized for something a lot older than all that: the nearby coal mining pits were the location of a significant archaeological find: the oldest hunting spears ever discovered (around 300,000 years old! ), proving that humans were already hunting big game with such tools much earlier than previously assumed. To milk this archaeological sensation, a new research and "experience" centre called "paläon" is currently under construction, which will present the archaeology of the region to visitors from some point in 2013 onwards (if things go to plan).